In the morning, the Senior Civil Servants led a conversation with a group of Tuntum staff, including: Dara Ivekich, Service Manager, Chantelle Miller, Senior Housing Officer, Rose Slacks, Senior Accommodation Officer, Sarita-Marie Rehman-Wall, Tenancy Engagement Officer, Ross Hindley, Senior Building Surveyor and Amanda Taylor, Senior Accommodation Officer . Afterwards, Richard Renwick, Chief Executive, took them around some of our schemes. 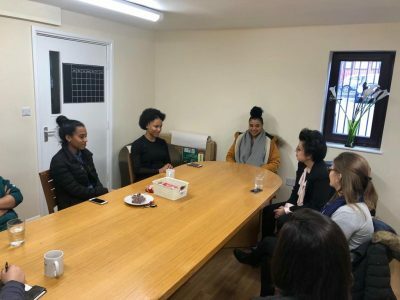 In the afternoon, they talked to some residents of Karibu and Imaani, and at the end of the day they met with Tuntum’s Senior Management Team for a ‘round up’ discussion. It was an extremely successful day, where Tuntum have proudly managed to show and express what they are all about.